China Yangtze River Information: cruises, maps, pictures, ships, three gorges dam. 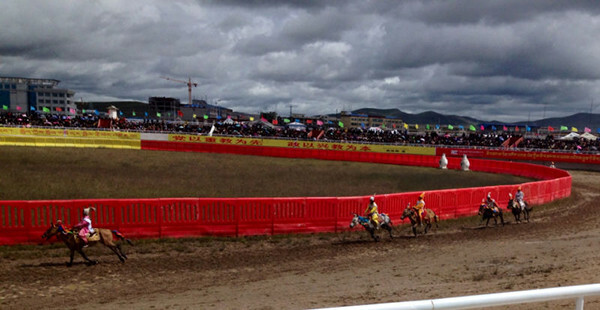 The Nagqu Horse Racing Festival is the grandest annual event in northern China’s Nagqu Prefecture, the largest prefecture in Tibet Autonomous Region, aka Tibet, and indeed, the grandest annual event in all of northern Tibet. August is the golden season on the vast grasslands of Nagqu Prefecture, and the time when the grass is tallest and the weather is most accommodating to those who enjoy the great outdoors. Well in advance of the festival, Tibetan herdsmen and their families begin to trickle into the seat of the prefecture – also called Nagqu – from various parts of Tibet. They arrive on horseback still, bringing with them the tents and the furnishings which will provide them a ‘home away from home’ for the duration of the festival. As time passes, the trickle becomes a steady stream, the stream eventually a flood. Once the tent is raised, life begins to take on the resemblance of normality, albeit, tinged with the excitement of the gathering of so many landsmen and the anticipation of the upcoming competitions. In the evening, the scene becomes almost picture-postcard idyllic, with the rays of the setting sun casting long shadows from the tents and lighting up the undulating waves of the sea of grass, smoke rises from the chimney-holes of tents as supper is made, children are playing beside flocks of sheep that are huddled closely together for the sake of safety, and horses can be seen drinking from the lake in the distance, or grazing on the tender shoots of dew-moistened grass nearby. Older boys and girls take advantage of the social gathering to meet and flirt, dancing the Tibetan Guoxie (“Village”) dance. On the day of the opening ceremony, the people of the village of Nagqu and those from neighboring villages pour into the festival grounds from all four directions as the excitement heightens. Flagpoles are staked out to mark boundaries, their colorful flags fluttering against the vast blue sky. 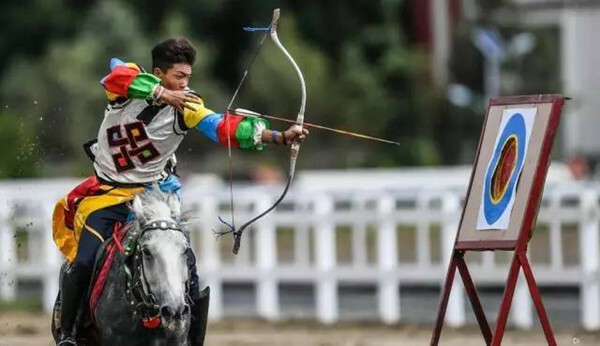 Then the horseback events begin, some involving sprints, some involving special riding skills such as concealing oneself on one side of the horse, leaning toward the ground to plant a spear or to pull up a flagpole, etc., and some involving bow and arrow feats while on horseback. There are also wrestling matches, which always attract large crowds; and there is of course lots of dancing, and as the day winds down, plenty of eating, drinking and merrymaking. After the day of the opening ceremony, a number of more organized, longer-duration events take place. 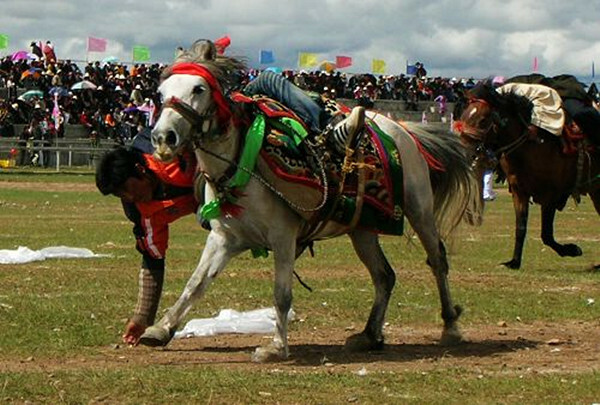 These include horse races, yak races, tugs of war, the Tibetan equivalent of a weight-lifting tournament (i.e., lifting and carrying mini-boulders of increasing size and weight), and, again as the day wears down, eating and drinking as well as dancing and singing performances, or the staging of Tibetan operas. These various activities take place over the space of up to 7 days, but not less than 3 days, depending on the number of participants (the greater number of participants the longer it takes to hold each event). To any given event, except perhaps for dancing and dining, in which all participate, some will participate while others will enjoy it from a distance, i.e., as spectators. 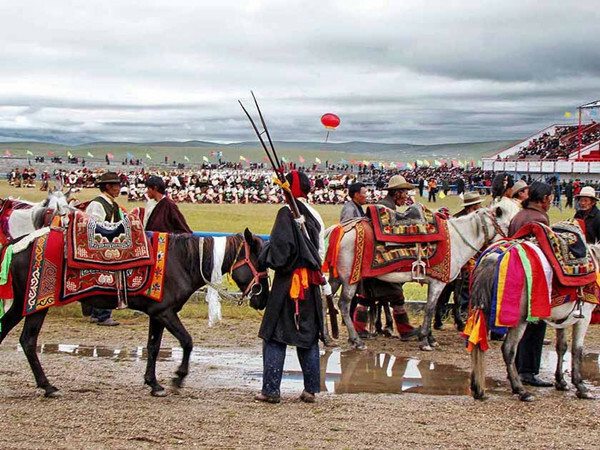 For visitors who would like to observe such festive celebrations first-hand, either as a participant or as a spectator, UME Travel’s Nagqu Horse Racing Festival Tour offers the tourist the unique opportunity of enjoying this annual festive occasion together with local Tibetan villagers from all across Tibet, where the visitor will be quartered with a Tibetan family, and can thus learn a bit about Tibetan customs while enjoying the company of one’s hosts when they are at their gayest and most hospitable. From May to September every year. From November to March of the following year, it is a dry windy season, the climate is dry, the temperature is low, the lack of oxygen and sand is large, and the duration is long. Relatively warm from May to September, it is the golden season of the grassland, with a mild climate and beautiful weather.